Goh Yu Xuan with her grandmother, Tan Ah Hong. In today’s world, it can be tough seeing Granny or Grandpa. With families scattered in various parts of the world and kids busy with school, grandkids can sometimes find it hard to catch up with grandparents, much less see them beyond special occasions. There are tons of benefits to bonding with grandparents such as grandparents can provide the grandkids with a sense of cultural heritage and family history as well as lots of love. It is with this in mind that seven Singapore Management University (SMU) first-year students decided it was time to do something about this as part of a community project for their module on leadership and teambuilding. On Saturday, they held an event called “A Silver Date”, where six grandparents (mostly grandmothers) were the centre of attention. 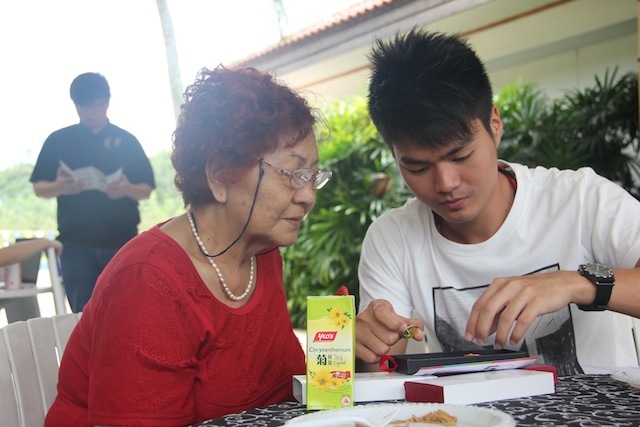 Another participant with his grandmother. Besides grandkids bringing their grandmothers, even some other members of the families wanted to take part at the event at the Orchid Country Club. Supported by Young NTUC, the event which ran for two-and-a-half hours consisted of lunch, playing games, massage therapy and sharing of the five Love Languages including words of affirmation, quality time, gifts, acts of service and physical touch. Jessie Chui with her grandmother, Lee Kwee Eng. Another participant, Jessie Chui, 23, also shared not seeing her 71-year-old grandmother, Lee Kwee Eng, very much. “I only see her once or twice a year as she lives in Kuala Lumpur, Malaysia.” At the event, Chui, a physiotherapist at St Andrew’s Community Hospital, shared the importance of touch and how it can bring a calming effect to loved ones and reduce muscle tension. Though Silver Date was a small-scaled event, it nonetheless achieved its goal of grandkids spending time with their grandparents and hopefully more interactions to follow. SMU student and organiser Goh said she will continue emphasising the need to spend more quality time with grandparents and hopes to continue holding this event again at a later time. ** So how can grandkids stay connected more with their grandparents? 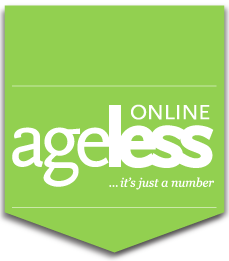 Make regular visits if your grandparents live nearby and make sure you pen in the time. Also, encourage your grandparents to drop by. With technology being so advanced these days, take advantage of e-mail and even Skype if you can. If computers are not their thing, consider the good old telephone as your next best option. You can also send pictures to your grandparents to keep them up-to-date on what is going on with your life. So no matter the reason, you can stay in touch with your grandparents.